Playhouses are so much fun. I had one in my backyard when I was growing up–an ugly green aluminum shed that stored the lawnmower and rakes. It was fun to play in anyway, though, and I was always good at “pretend.” Some days it was a Cape Cod. Other days, a castle. If I’d had a yellow cottage like the one above, I never would’ve come out! I would’ve insisted on sleeping there and having all of my meals delivered to the front porch. 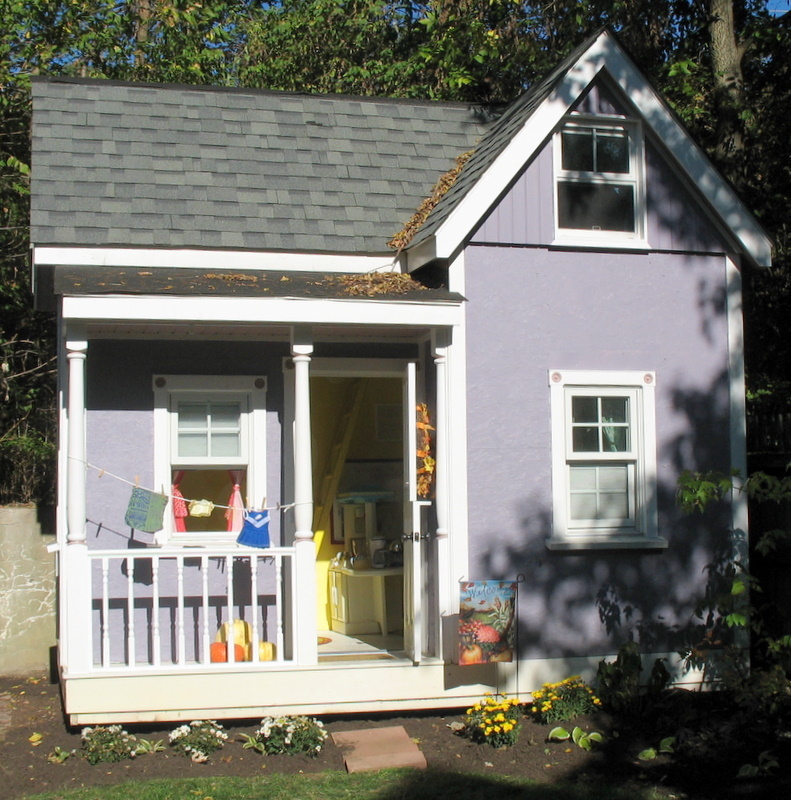 This is the playhouse that Linda of Restyled Home built for her daughter Sophie (above). If you haven’t seen it yet, be sure to go to her blog and take the tour. I want to live in it myself! At the Columbia Tusculum House Tour that I showed you photos of last Fall, one of the homes had this purple playhouse behind it. The homeowners built it for their daughters as a Christmas gift. Lucky girls! We made ourselves right at home. The owners provided fresh-baked Snickerdoodle cookies, which were perfect for an impromptu tea party inside the little house. Double-check to make sure your link works and goes to the right page so it doesn’t get deleted! 5. TK – Why waste a garage on a stupid car? 41. Lisa @ Coastal Nest!!!!!!!!! 67. Cass at That Old House; Hooked on House Blessing! 75. Leila –Make something beautiful for your home! I always wanted a playhouse growing up, but no such luck. 🙁 Those are so adorable! Lindsay’s last blog post..Are You Ready for a Challenge? my granddaddy built me a playhouse when i was a kid (https://www.springtreeroad.com/springtreeroad/2008/04/sand-dragons-an.html) looked very little like these, though! We are visiting our family beach house next week, and one of the neighbors has the most adorable playhouse for her grandchildren. It even has electricity! My kids love visiting and playing in it, so this post made me even more excited about our trip. I am excited to be participating in my first ever ‘hooked on Fridays’! Have a great weekend. These are so better than the Toys ‘r’ Us plastic job I put together for my kids. Maybe it’s still back there mildew’ed over. Terry Kearns’s last blog post..Why waste a great garage on a stupid car? So much fun! I had a friend with a playhouse when I was little. We used to mix spices in the “kitchen”. While it kind of smelled wierd after a while (from all the odd spice combinations), we had some great memories in that little house. jill’s last blog post..Hooked On: Polaroid Photos! I love Linda’s playhouse! What a dream! I myself made due with a shed, similar to you. Oh I LOVE playhouses. I love all the pictures you’ve included. We had a tree house/tree fort when I was growing up…not quite the same. Your post has me now planning a future playhouse for our daughter, except I think I might want to keep it for myself! haha! Hope you have a great weekend Julia! What bright and bold little houses. I love the laundry hanging to dry. Your playhouse with rakes and everything – love that image! I love Sophie’s little house. All of the details down to the buggy planter out front are perfect. I have a 3 & a 4 year old who would love it. Being an unsupervised play space, she was very brave to do it all so white. I would love a little house like this for ME!! I love playhouses too! 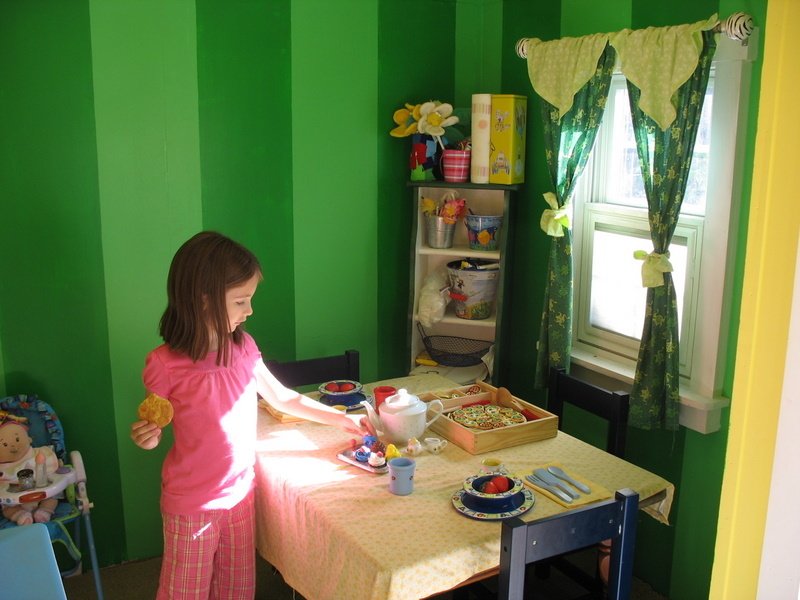 Our daughters had a wonderful bright colored one at our old house that my husband built. Now here my boys have a raised fort instead. The best playhouse I was ever in was the House at the Vanderbilt Mansion in Newport, RI…a working stove, sink and fireplace with a upstairs..incredible! Suzy’s last blog post..They Have Me Hooked……. I love playhouses! There is something magical for a child to be able to fix up thier own place. My husband built our children a playhouse that looks so much like the first one you have posted, cute and yellow with a little front porch and a loft. These are just darling! We SO want a little house – just to decorate! Those are so pretty, you have me hooked on playhouses too! Love em. My girls would flip over a playhouse like that. Your playhouses are ADORABLE and VERY fashionable! Come over and link with me! I was lucky to have a little playhouse when I was a wee one. It definitely wasn’t decorated like that though!!! Adorable playhouses! 🙂 What lucky little girls!! I love those playhouses! What a dream! I always wanted one as a kid! Tam’s last blog post..Thank You Friends! 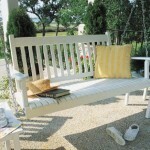 Dagny @ Beautiful Living’s last blog post..Sommernyheter fra IKEA! / Summer News from IKEA! Those playhouses are adorable. If I had one, I’d never leave. As a military brat, we moved too often for me to have a playhouse, but there was an old shed at my grandparents house that my cousins and I used for a playhouse when I visited. It was just and old white washed shed that wasn’t used for anything, but we had so much fun in it. I’m starting to get hooked on all my friends’ bedrooms. It’s a little weird I know. 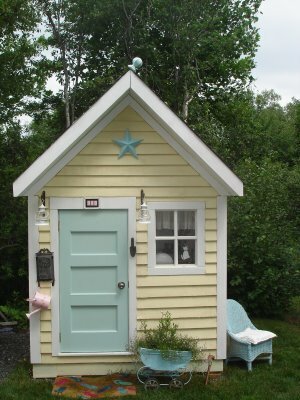 Love all these play houses…I think every little girl dreams of one! Perfect for spring which will hopefully arrive on my doorstep today! Oh my goodness…is that really a “playhouse”? I’m ready to move right in! I ALWAYS wanted a playhouse when I was little! I would make a “house” from two card tables and some big pink blankets! I have such great memories of playing in my pink house!! Thanks for sharing! my link at #45 didn’t work so you can delete that one. I am begging for a playhouse in my yard. We don’t have any kids but I still want one. The one you are showing looks so adorable with all the flowers planted in front. Just perfect. Oh I want a playhouse!!!!! Those are adorable! 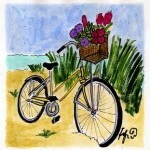 suzanne’s last blog post..Hooked on a good read!!!! Thank you for featuring my/Sophie’s playhouse! I can’t wait to get back out there and enjoy it with her and complete the landscaping around it. After thirty-eight years, I finally have a playhouse – even though I do have to share it with my daughter!!! We have a playhouse like these! It is so charming, and it makes everyone ooooh and awwww over our quaint backyard. The playhouse was included in the purchase of the house, so we lucked out for our two little girls! Julie @ Organizement’s last blog post..Hooked On…Silver Accessories! Robyn’s last blog post..Outdoor Wednesday! I always wanted a playhouse when I was little! Wow, these are incredible! Those are some very lucky children! What a wonderful subject to post about, thank you! I love playhouses, anything goes. You can be as crazy and whimsical as you want. I think every father should learn how to build one. It should be a requirement! 🙂 Wouldn’t that be crazy?! Project Playhouse raffles off a chance to win a dream playhouse each year here in Dallas. Designers and builders work together to create the ultimate play houses! It’s one of my favorite tours to visit each year. We have a playhouse outside, but it gets so dirty. I’d like to build one inside my daughter’s room or turn her closet into one. Wouldn’t that be fun? Oh, you’re not gonna believe what I’m hooked on this week 🙂 See ya soon! Tamara’s last blog post..I’m HOOKED on India! It is always wonderful to celebrate the start of the weekend with you, Julia! Love these little houses. The first one has to be my favorite. own. Thank you for the inspiration! In January, I posted about our own playhouse…this is the post I have included in the link. We no longer have the playhouse, and we still miss it sometimes! Playhouses are such magical places! I hope you enjoy seeing it! 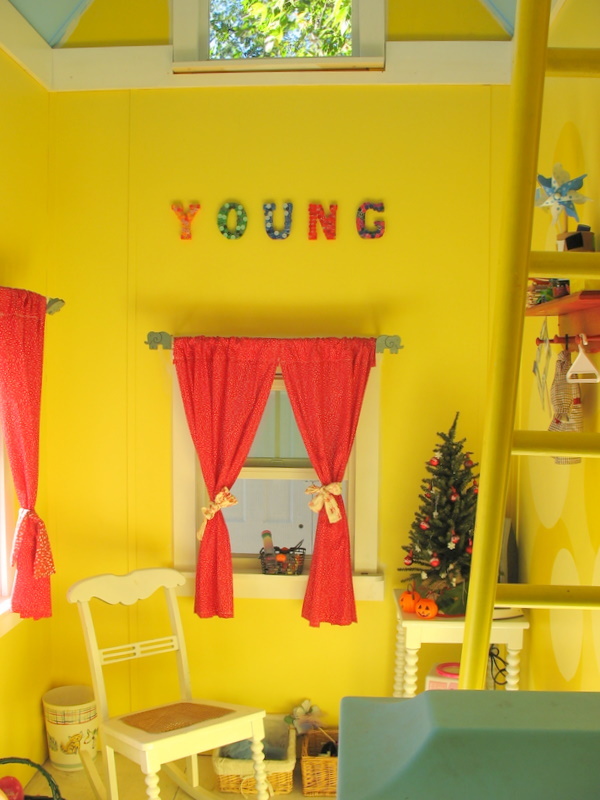 #2 is so adorable…, the house I played with was a doll house, handmade by my parents and it was fun. To play “real” house…, lucky kids! Right now I am doing a series of entitled All Things Irish and am so inspired by the Irish countryside and other lovely things. Those little gems are totally over the top! Loved this Hooked On Friday post Julia! Those playhouses are wonderful, especially the first one. I agree, I’d live in it, too. :0) Have a great weekend! Happy Friday, and as ever thanks for Mr. Linky. I had the shock of my life yesterday, Lily and I were in the garden and she went to go into her playhouse which she was last in last summer….umm her head is above the door! I have a horrible feeling by this summer she’ll be out of it. Oh I love playhouses, always wanted one but had to content myself with visiting my friend’s. But I remember thinking, “she just doesn’t know what to DO with this house!” Even then, lo those many years ago, I was a House Junkie! Thanks for your kind comments on my post today. And I don’t know how you manage to keep up with all you do! Amazing. 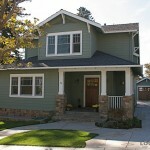 Cass’s last blog post..Hooked On … House Blessing, Open House, Crunch Time! I just mailed a birthday card to a lady who is celebrating her 95th birthday in March. Her goal is to have her new playhouse finished in time for her birthday celebration. She is filling it up with her favorite collectibles and it will be a special place to enjoy her favorite hobby – “quilting”. She is living proof that one is never to old to have a playhouse!! By the way, her playhouse even has a set of stairs that she walks up with complete ease. Julia, (re:Southern Lady mag) why not try going to the website http://www.southernladymagazine.com to see if they have that issue available. They usually do have back issues. I tried to find mine, and it seems to have disappeared. If I found it, I was going to offer to scan the article for you and email it to you. I’ll keep looking. I’m hoping Costco will come out with a cute affordable play house this year. I think my girls would love it. Although my oldest daughter insist I build them a tree house. Looks like I just made it to your party, sorry I’m a bit late. 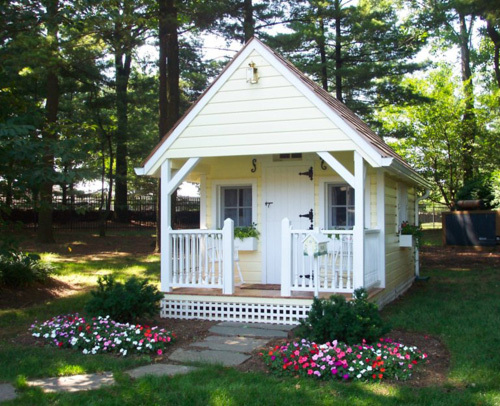 Your little cubby houses are just so adorable. I always wished for one when I was little, we only had a fabric and metal frame tent. I did spend hours in it playing. But nothing like your beauties. I have a wonderful glass collection on my site today, I photographed my girlfriends collection which is just fabulous. I hope you get a chance to pop by and have a look. By the look of your list you must be exhausted visiting everyone. How do you find the time? Those houses are so stinkin’ cute! My kids would love that. Leila’s last blog post..Go ahead and make something beautiful. I used to play in my grandma’s old rabbit hutch. Ah memories. Those little houses are gorgeous! I hope I’m not too late to join. I accidentally put a link to my blog address the first time (#76) If you wouldn’t mind deleting that one, I fixed it and linked to the specific post in #77. Michelle’s last blog post..What Can You Buy With A Dime? I love playhouses! I have a boy, though. Can boys have playhouses? heh, your playhouse was a shed, too?! I always thought because my dad was a handy craftsman he would build us playhouse, when he didn’t, we built our own unstable treehouse! It looks real enough that you can live in it. Please forgive me but I didn’t know how to submit my post regarding Hooked on Playhouses? ?/ Sorry for the lack of knowlege but wondered if you could help me out. I have always wanted a playhouse…I STILL want a playhouse! First I wish I had one when I was a little girl, to those girls who had a playhouse made by there parents lucky for you and be thankful, treasure the moments you’ll spend there. And let me share this, my parents gave me a Victorian Cottage which I happen to see at https://www.classicdollhouses.com/dollhouse-kits-easy-build.html for I did a research for a dollhouse to give my daughter for her birthday and maybe with the help of your blog I can convince my husband to build a playhouse as a present for our daughter on December provided she will do good in school and in doing here chores at home. .-= Judy from cutest-little-things´s last blog ..A Thanksgiving Surprise (and a plea for recipes!) =-.